The Garmin Astro GPS Tracking System. We think this is the single best system on the market for true GPS tracking and mapping capability. The system normally retails for $649.99, but is now available for $549.99 while supplies last. Tracking a dog requires two devices, one is the tracking unit which is attached to the dog's collar (or built into the collar) and the other is some type of receiver device to see where the dog is. Some systems use a cellular phone as the receiver and are therefore dependent on using a cell phone provide such as Verizon or AT&T. The other systems have a dedicated receiver which you purchase with the tracking device. Some of the tracking devices use the GPS system to identify where the dog is and others use something called radio telemetry to locate the dog. The GPS tracking systems get precise location information from the Global Positioning System which beams down precise location information from satellites. This type of tracking system then communicates back to the receiver either through a mobile phone network to your phone or by radio signal to a dedicated receiver. The radio telemetry based systems send out a radio signal that allows you to pinpoint the direction of your dog and it gives some information regarding distance. The major differences are monthly costs for the mobile phone operator, mobile coverage where your dog is, range of the system, the accuracy of the dog's reported location and the battery life of the tracking device. In this situation we recommend the Garmin Astro GPS. The Garmin Astro gives you an exact location, distance from you, direction traveling (if moving), and status or what the dog is doing: running, pointing, sitting, etc. This is a major advantage over radio based systems which do not tell you precised location or distance, only direction. The 320 version of the receiver with an extended range antenna can track up to reported 9 miles away. The Garmin Astro System uses a handheld receiver, the 320 tracking system, which you can carry with you. You combine the 320 with a Garmin DC-50 collar. This combo is one of the most popular setups on the market for GPS tracking systems. The combo for a single dog is about $549. You can use the system with up to 10 dogs. Each extra DC-50 collar costs about $299. The other option is the SportDog TEK Tracking GPS System. 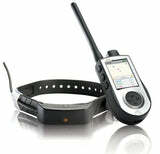 The system consists of a handheld receiver and tracking collar, and retails for about $399. Like the Garmin Astro, the SportDog TEK has a range of about 7 miles. This system can accommodate up to 12 dogs. Extra tracking collars cost about $259 each. You can also buy more expensive collars that combine the tracker and an e-training unit. The combo pack with the e-training unit costs about $499. Both systems are quite good, and will serve you well. The major differences are the ability of the Garmin system to give you mapping history of your dogs path. The TEK system does not have this mapping capability. The other major difference is the ability of the TEK system to be both a tracker and a training device. If you need mapping, go with the Garmin, if you want tracking and training then the TEK system may be a better choice. If you need to cover an even larger tracking distance than the 7-9 miles provided by the Garmin Astro GPS and SportDog TEK, then there you may want to consider a radio telemetry based device from Marshall or Tracker. Garmin GTU 10 which uses the AT&T network. These devices work well if you and your dog are in range of a cell tower for your provider, however if your dog is not within range of a cell tower the signal will not be picked up. The Tagg system is reported to have a 20-30 day battery life when the dog is mostly near the docking station and 3-4 days when away from the docking station. Tagg supports one geofence set at a minimum of a 75 yard radius, which is a pretty large area. The Garmin GTU 10 is about $200 for the unit and $50 per year for the AT&T service. The Garmin system uses a zipped nylon case which attaches to pet collar with Velcro. We have not tested this, but it also may be susceptible to disconnecting from the collar. The Garmin GTU 10 claims that battery life is 1 day to 1 month (depending on frequency of location updates). The Garmin system has the ability to set up 10 geofences which trigger different alerts as the dog passes through the geofence.